HushWall is a highly effective rubber backed plasterboard used for sound insulation and to create a vibration damping effect. How it works - HushWall is a combination of plasterboard (12.5mm) and granulated rubber (20mm) creating a high density panel with a density of 780 m3. 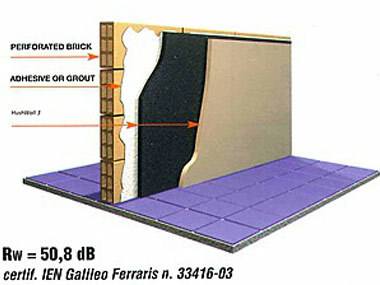 This combination of materials and mass makes HushWall an excellent sound insulating product. HushWall is widely used for partitions walls and plasterboard ceilings where high levels of sound insulation are require. HushWall can also be used to overlay existing masonry walls to dramatically increase existing sound insulations properties. Sound insulation power RW = 57.5dB. Can be fixed directly over existing wall/ceiling finishes.